Exclusive Interview With Tom Smurdon, Audio Director of "Dark Void"
Dark Void is a new sci-fi adventure game from CAPCOM for Xbox 360, PS3 and PC. The story is about a cargo pilot called William Augustus Grey who crashes into the Bermuda Triangle and is teleported to a parallel universe. With the help of other survivor humans and Nikola Tesla, Willian have to go back to the earth, but first fighting with all kind of creatures on the Void. 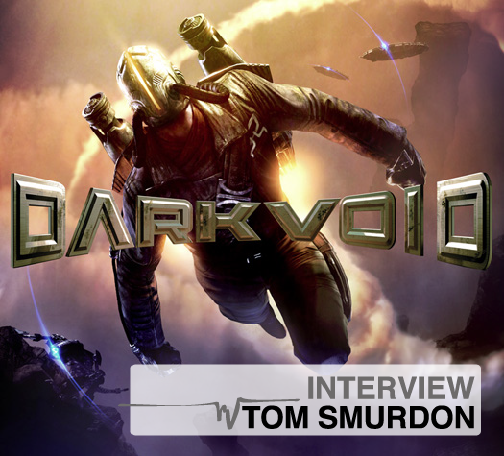 Here is an interview I had with Tom Smurdon, Audio director of Dark Void. Designing Sound: Hi Tom, please give us an introduction of your career and how was your start with sound design. Tom Smurdon: Hi! When I was younger I learned to play guitar, but I was always playing more with the effects. I loved plugging pedals into pedals and more pedals to see what kind of noises I could make. Then I got a 4-track and knew that’s what I wanted to do. I ended up going to Full Sail to become a recording engineer. I interned and then became a second engineer at Bad Animals in Seattle. This was in the early 90’s and I got to work with some great bands Soundgarden, Deftones, Staind, Pigeonhed, Presidents of the USA, and the Foo Fighters. I also worked with some great producers and engineers. There is a lot of downtime when you assist on a record and during mixing the bands get so bored. Luckily right around this time the playstation came out. If I wasn’t in the studio I was home glued to that thing. All the bands had them too. The music industry was changing and I bought my first daw, PARIS. I started freelancing more and doing some sound design work then. I ended up working for an online education company as their audio guy. I would edit dialog all day and sound design the flash animations that went with the lectures. DS: How did you get involved with the games industry? and how with Dark Void? TS: My wife was still working at Bad Animals and she would record voice talent for videogames. She was working on a game called Voodoo Vince for the Xbox. One of the guys asked her if she knew of any sound designers that worked freelance and bam, I got my first videogame! I still have no idea how I talked my way into that job. After that game, I got a job working for Omni Audio. I worked on sooo many games with those guys over 6 years. I have sounds in over 22 shipped titles. We did all of the Guild Wars games; I think I am personally responsible for over 300 different sets of monster sounds in that series alone. Worked on Halo 2, the Sims, Vanguard, Rise of Legends and on and on. Omni is a great group and they will do entire games or just get pulled in at the last minute for emergency sounds when teams run out of time. Airtight Games was looking for an audio team and they hired Omni. I became the audio lead on Dark Void and then when the project ended, I stayed on as Airtight’s audio director. DS: How long was the development cycle of “Dark Void”? TS: It was right around 2 years from vertical slice to finished game. DS: How the concept of the game influenced the audio crew to start thinking about sound? How was the relationship with the developers, artists…? TS: The artists would show us a ton of concept art and that would let us start to build our source libraries. The story starts out in the 1930’s and involves Nikola Tesla, so we wanted a lot of electricity source. We also wanted it to have an older feeling to it, but not make it sound like an old movie. And I knew I had to put a Theremin in the game somewhere. There always seem to be some term that gets used for every game. For this one it was ‘Dark Energy.’ Dark Energy is what the Watchers used to power their weapons and vehicles. Poor Chase Combs. He was another sound designer at Omni who worked a ton on this game. He would just get revisions saying, make it have more dark energy. I think he wanted to kill me whenever he heard that term. The devs and artists were great, it was just a matter of keeping up with everybody. The game changed a bunch from the original vertical slice. It started out as a more graphic novel styled game and turned into a more realistic one. That changed how we approached all of our sound design. The survivors guns had to be more realistic and the watcher guns nastier. DS: Could you share some interesting field recording experiences? What were some of the sources for the sounds of the game? TS: We went up to the American Museum of Radio and Electricity in Bellingham, WA and recorded all of this old electrical gear they had. We only had a day so we recorded everything to a bunch of different mics since we didn’t know what piece of equipment would interfere with which mic. It was different depending on the contraption the owner was playing with. The tesla coils were shooting out arcs of electricity all over the place. We stayed far back from that stuff. We got a lot of great source from that trip. They also had a ton of old radios and televisions that we recorded all of the switches and knobs from. DS: What were your primarily tools for sound design on Dark Void? TS: I used nuendo, sound forge and a fireface 800. Uad-1 cards for a lot of processing. Chase also found a great little plug in called Pitchfork. That was used a ton on the giant metal beasts in the game. When you use it on metal groans it can make this incredible giant mutant sound. DS: And how about the implementation process? Could you tell us more about that? TS: When you are on the ground, enemies are pretty close but when you fly around with your rocketpack, the distance to enemies multiplied by 20. If you hear all of the flying vehicles when you are in ground combat, you wouldn’t hear the ground combat. So we had to come up with a way that the radius of sounds changed depending if you were in the air or on the ground. In a game where you can just take off at any moment, this was one of our biggest challenges. I also changed the way the air vehicles sound depending on your location. In the air, your rocketpack is playing all the time. So it would knock out all of the mids on the UFO’s and planes. Different layers play depending if on foot or in air to help compensate for the rocketpack. Putting in music was a dream. Bear McCreary is a gamer and he was totally into the way the music would work. He wanted no repetition and he recorded all kinds of alts and solo tracks that let us play the tracks differently just about every time they are used. The music has a great progression as it changes from more natural instruments to just crazy over the top at the end of the game. He has a great blog post up on his site about scoring the project. DS: What software you used for the implementation process? How was the sound engine of the game? TS: We used fmod with some customization and it worked pretty well. We did have some issues with streaming too much info and we are working on solutions for that on our next games. 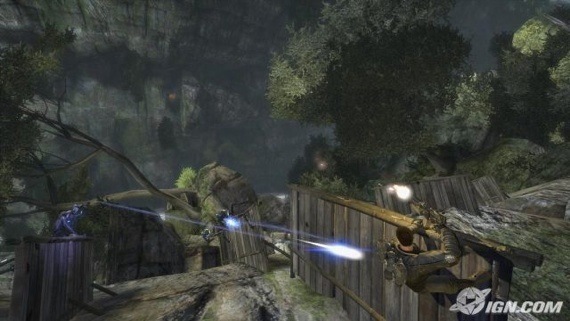 DS: There are a lot of different weapons in the game… Any experiences or specific process there? We started with just the machine gun. And we made it BIG. The thing is that it was the smallest gun in the game, so we kept making all of the other guns bigger. We recorded a lot of guns for the game. The machinegun uses shotgun blasts for part of its sound. There were 10 different guns sounds used to make the machinegun. We also made all of the weapons surround. The coolest ones are where we could put the whine from the automatic weapons in the rear speakers and the shots were in front. And always, more dark energy never hurt. TS: There is a Theremin mixed in with the UFO. I didn’t want it to sound too 50’s sci-fi so it really only comes out as you are banking and when you are hijacking them. Most of the creatures are mechanical. Lots of metal creaks and groans, but we tried to stay away from too many servos. Inside of each pawn robot is a living slug. So if you are lucky enough to have one pop out, you can stomp it for a nice squish. I had a temp pig squeal attached to the slugs during production. It was so obnoxious. There was a bug where it just played over and over again if there was one near you. One of the guys from Capcom told me he was going to cancel the game if I didn’t take it out. Another request I had was to make the sarpa (snake creatures) sound intelligent. So we made up some nonsense chants and english taunts and split them to 2 tracks. One track we put through a high pass filter and then a tremolo. That track is automated so that its volume only comes up at the ends of words and the tremolo was automated so that it would go from fast to slow at the tail. When this is mixed with the non-processed track, it gives you a little snake sound. All of this was pitched up and then added a small amount of verb. 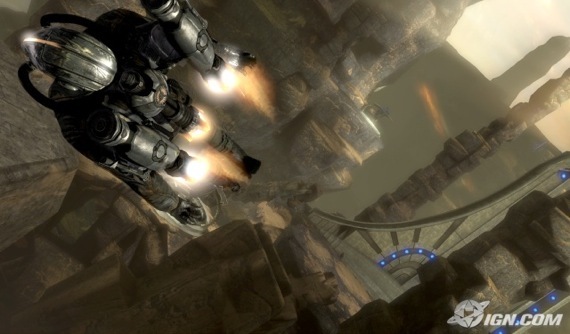 DS: The Jet-pack is one of the key features on the game… How was the sound design of it? TS: The jetpack was fun to make. That was done really early in the development cycle so I figured everybody would be sick of that sound by the end, but surprisingly we didn’t get any complaints. I set out to make something that was going to be on a lot, sound big, but really take up only a small portion of the audio spectrum. You really need to hear all of the other vehicles, music, dialog and weapons at the same time. We added the sonic boom late in the game to give you a better feel of propulsion as you start flying. I also made the sound louder when you first take off and then the volume comes down on it as you are flying so you can hear everything else. It was also compressed and limited pretty heavily to keep it out of the way. I think the source was a couple of jet engines with a pitched vacuum cleaner and a low rumble. Sorry, I don’t have that project here at the moment. DS: How you do the sound design direction for the game? Any special influence or method? TS: I’ll start building source libraries early on and I will usually stumble on to some sound or weird plug in that gives me something new. I always keep my H4 on me and that’s great for source that you didn’t expect. Everybody always wants everything bigger, but I always push back saying that if everything is loud, nothing is loud. As for influences, I always check out what the concept artists are looking at. They find great source and then if I use some of the same stuff as reference it helps the art and sound to gel better. 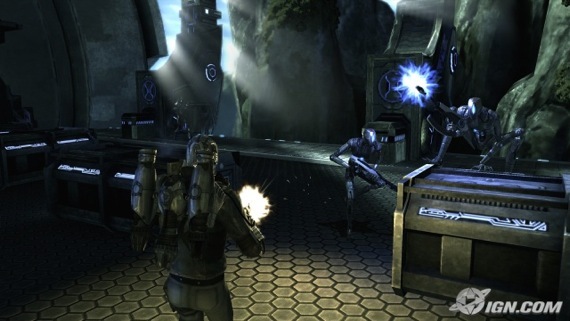 DS: Did you find any limitations or technical issues that prevented the team for develop something? TS: I always want more memory, more streaming and more time! I am pretty happy with the audio for Dark Void so I can’t really complain. DS: What would you like to have in a next generation consoles? TS: Real time convolution reverb and more memory. Always more memory. DS: Finally, could you tell us something about your actual and future works? What’s next? TS: I would love to tell you about our next projects, but unfortunately everything is still unannounced. very cool, love the tesla coils stuff. How ironic that a sound engineer is interviewed and published to the web in a soundless format.